Glass jar is dishwasher safe. Wipe grinder and wood lid with a soft brush or cloth. To adjust the grain of the ground beans, remove the cap, handle and locking washer to expose the threaded shaft. Hold the shaft tightly and rotate the wheel clockwise for a finer grind or counter-clockwise for a coarser grind. Once you have the wheel where you want it, replace the locking washer, handle and cap. 6.5" L x 4" W x 9.25" H; capacity of top hopper approx. 4-5 tbsp. of whole beans. Capacity of jar approx. 20 tbsp. of fine ground coffee beans. Though it takes a little bit of extra strength to hold this beast still while grinding, nothing compares with the solid, sturdy feel of cast iron and wood. A simple, gorgeous design. Purchased this with one of your Kenyan coffees and not only does it work well but the coffee was fabulous too. A "Steam punk" coffee grinder? That's hilarious. It would only be steam "Punk" if it were retrofit with a modern motor or other method that makes it non-Victorian in it's obnoxious hand cranking use. This is just plain "Steam." I mean, this is the same as showing up with a horse and calling it your "Steam punk vehicle!" If you buy this for actual use, you deserve the lesson you'll receive in manual labor. Most young people do need to experience what the real tactile, manual labor world is all about instead of the luxurious life they inherited. So, I suppose some redeming value will come if any of them buy this thinking that they are being "Steam punk" or that manually grinding beans for a teaspoon of coffee is a hip thing to do. Well done on the marketer who "Up cycled" these from some 3rd world or former Soviet block country and realized young dumb Americans will buy anything perceived as "Hip!" This worked well, as far as the grind and is pretty, but broke almost immediately. The grinder is glued to the top of the mason jar and the glue completely failed after 2 uses. We can still use it, but it's no longer held together. I was disappointed that it broke so quickly. I wasn't sure what to expect with this coffee grinder. I was very surprised at how well it works. I love that the grind coursenes can be changed with a simple twist of the locking nut. The burr grinder itself is made of ceramic so little chance of it dulling or breaking over time. The coffee does take awhile to grind but the twisting of the handle is very easy and smooth so no need to skip your workout. The product can't be assembled, since the screws that came with it are too small. So it's unusable. Moreover, the grinding mechanism, is made of plastic, instead of being some metal. I was planning to return the product but I was too busy & missed the timeframe. Great grinder. The looks are classy with a little bit of edge. It grinds perfectly and holds the setting. Great construction and works very well. It takes a little longer and requires more effort, but it helps create a great experience and a wonderful cup of coffee. 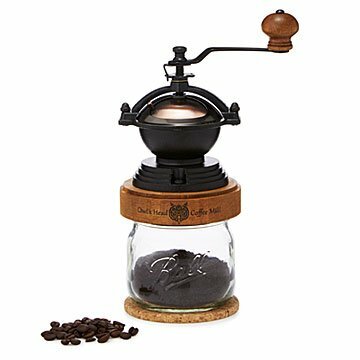 I bought two of these beautiful coffee grinders, one for my grown son and one for my grown daughter, in March. They have both been using them almost daily and absolutely love them. They are coffee connoisseurs and only buy expensive coffee beans and this grinder just matches with their style. They grind enough to fill a French press and the grind produces delicious fresh ground coffee for them daily. They couldn't be happier with their grinders. A must have for anyone who is hard to buy for and who appreciates excellent coffee and beautiful things.